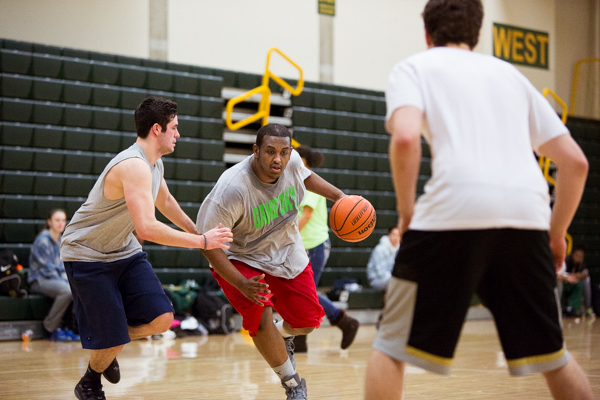 Amar Ali learned about the three on three basketball tournament the day before it began. Although he didn’t have a team, he arrived the next day. 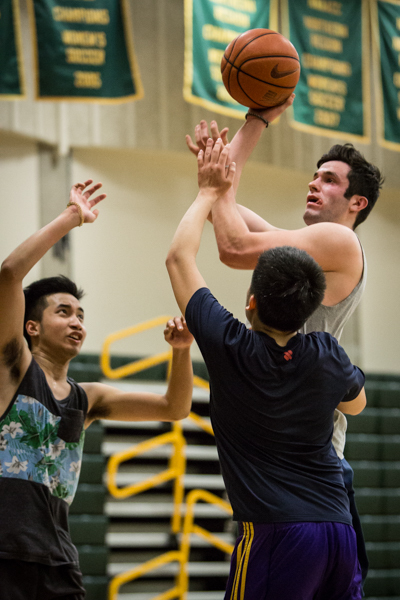 The next thing he knew, he was on the court with two international students from Hong Kong, whose third teammate had to skip the game to take a quiz. And so Ali found himself on MML, named after a favorite restaurant of Winson Tam and Marco Siu, his two teammates from Hong Kong. 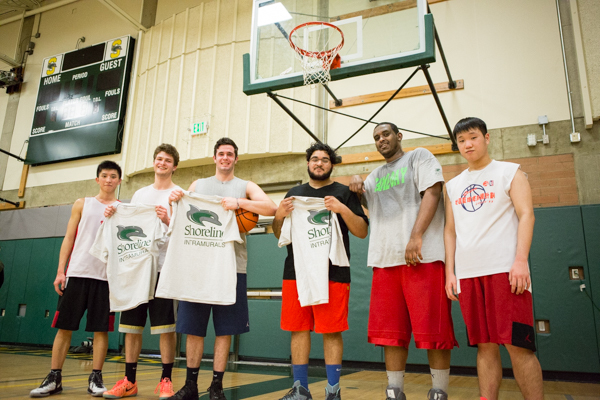 Shoreline Men’s and Women’s Basketball players are not allowed to participate in this tournament. Despite being built up at the very last minute, MML started strong. The Sabino’s had good offensive strength, as they had several good plays and could make some shots. He said their size was also a threat to him as they could bump him and get to the inside. Yet even with a decent offensive performance, the Sabino’s couldn’t match MML. Ali, who was constantly attacking from the low post, was unstoppable: the Sabino’s couldn’t stop him from pushing in, and when he had possession, they couldn’t even touch the ball. Beyond his offensive strength, Ali was also able to see openings made when he drew the Sabino’s defense to himself. Ali said this shows how the team was actually playing like a team more than individuals. However, what completely destroyed the Sabino’s was rebounds. They couldn’t box Ali out under the basket, letting Ali make an extra offensive play after a missed shot. MML was holding the lead throughout the entire game but for Tam, the game wasn’t easy for him at the beginning. “I was not having my shooting touch,” Tam said as he arrived late that day and didn’t get the warm up he needed. Siu, the third member of MML was in game mode, with a score percentage of nearly fifty percent. This, combined with Ali’s dominant performance, earned them an absolute devastating win over the Sabino’s”t by over 20 points. With morale high off of their last win, MML’s next challenger was Quick Are You Sirious – a team of 3 Chinese players. According to Tam, it was an easy win. The players on Sirious were smaller, with clumsy dribbling technique and less experience. MML maintained a strong lead throughout the game, securing another victory by a margin of over 20 points. Despite a decisive victory over Sirious, game three brought a challenge for MML. VSA, the opposing team, was spearheaded by a speedster who could outpace all three players on MML. VSA took advantage of this, using picks to juggle MML’s defense, often slipping the speedster past Ali. Unable to defensively counter the speedster, MML had to rely on their strong offense to push back against VSA. While Ali’s size advantage handicapped his defense against the speedster, it also made him an unstoppable offensive force. Ultimately, according to Siu, it was VSA’s reliance on the speedster that cost VSA the game. With two teammates who couldn’t match his off-ball movement, the speedster was worn down, and couldn’t match MML shot for shot. And just like that, MML advanced to the semi-finals. Game four launched with a smooth three pointer from Team BAD, but it didn’t take long for MML to even the score with a turnaround and hook shot by Ali on the low post. This kicked off a fierce battle, with MML holding a small lead even as both teams traded layups and threes. The vigorous competition was punctuated with fouls, especially on Ali, which included an elbow in the back. “Every time I was going in, instead of me going in for a layup, they started grabbing me so I only got to the free throw line,” he said. Then, with only five minutes left in the game, Tam sunk a three. This was followed by a three from Ali, right over the defender, securing a nine-point lead for MML. Although BAD was able to narrow the margin back down to six points, as time ran out their offense became rushed, with less passes and more wild shots. MML, on the other hand, maintained their flow, with Tam and Siu both hitting threes that earned them a 12-point and a victory. Ali said he didn’t blame the player that was guarding him – he understood that the player was just doing his best to stop him. Anyways, he said, they had a good game out there. Yet for MML, their pre-game analysis wasn’t enough to stop the pressure from Team Howard. Despite strategizing to counter their strengths, MML couldn’t match Team Howard’s technical skill. Furthermore, Tam and Siu’s ability to block or even significantly pressure was negated by Team Howard’s overall height and size advantage, giving Team Howard a much higher score percentage, and allowing them to launch threes from what Siu called a crazy range. Team Howard also had the speed and the upper body to drive to the inside, and keep MML from making those same drives. Siu and Tam also dampened the aggression that had carried them through their past four games, intimidated by Team Howard’s size. After hitting a hard-won layup in the beginning of the game by driving full-speed, Siu stopped attacking the inside as often. That taste of how challenging it was to even get inside and shoot gave him second thoughts about driving again. Offensively, Ali had strong possession, but struggled to sink shots even when he was under the basket or drove to a good spot in the middle lane. “I guess the fact that we had to play two games in a row really just burnt him out,” Tam said. Siu, Tam, and Ali all think playing the final game right after winning the semi-final game had them exhausted and that was also what kind of took them out of the game and by extension, the competition. But they still came in second place, and had a good time. “At the end of the day it was all good game,” Ali said. Tam and Siu think it was a great experience, especially for Tam. 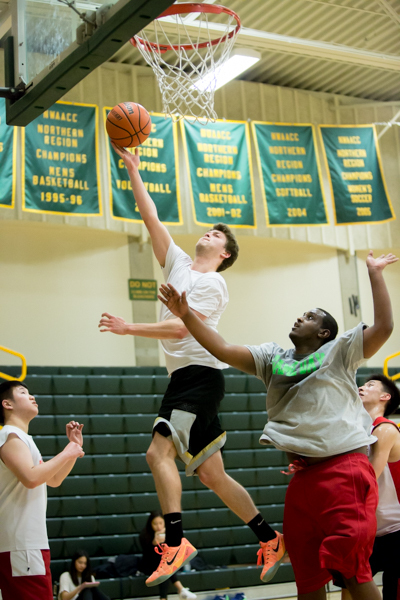 New to the US, with only two quarters at SCC, he thinks having this chance of playing with and against domestic students was an opportunity for him to practice his English. Likewise, Ali said he was happy with the team-up, and surprised by their performance. Even though they didn’t win, Ali said he was pleased with the way they went out, and would like to stay with them in the next 3v3 tournament the school has.